2005-05-12 Assigned to HALLIBURTON ENERGY SERVICES, INC. reassignment HALLIBURTON ENERGY SERVICES, INC. ASSIGNMENT OF ASSIGNORS INTEREST (SEE DOCUMENT FOR DETAILS). Assignors: SAINI, RAJESH K.
The present invention relates to compositions for treating subterranean formations. A treatment fluid that comprises an aqueous liquid, and a degradable surfactant derived from a degradable polymer is provided. Also provided are emulsified treatment fluids and foamed treatment fluids that comprise degradable surfactants derived from degradable polymers. This application is related to co-pending U.S. application Ser. No. 11/127,583, entitled “Degradable Surfactants and Methods for Use,” filed concurrently herewith, the entire disclosure of which is incorporated herein by reference. The present invention relates to methods and compositions for treating subterranean formations. More particularly, the present invention relates to treatment fluids comprising degradable surfactants and associated methods of use. Surfactants may be used in a variety of subterranean treatments. Such treatments include, but are not limited to, drilling, stimulation treatments (e.g., fracturing treatments, acidizing treatments), and completion operations (e.g., sand control treatments). As used herein, the term “treatment,” or “treating,” refers to any subterranean operation that uses a fluid in conjunction with a desired function and/or for a desired purpose. The term “treatment,” or “treating,” does not imply any particular action by the fluid or any particular component thereof. In these conventional subterranean treatments, the surfactants may be used for a number of purposes such as emulsifying agents, non-emulsifying agents, foaming agents, defoaming agents, viscosifying (or gelling) agents, dispersants, wetting agents, and the like. While a variety of surfactants have been used in subterranean treatments, various problems have been associated with their use. For instance, certain surfactants used heretofore may have undesirable environmental characteristics and/or may be limited by strict environmental regulations in certain areas of the world. As a result, use of these surfactants in subterranean treatments may result in the potential for the bioaccumulation and/or persistence of such surfactants in the environment, which may create potential dangers for their use, such as adverse effects on shrimp and other aqueous aquatic species. An embodiment of the present invention provides a treatment fluid for treating a subterranean formation. An example of such a treatment fluid may comprise an aqueous fluid, and a degradable surfactant derived from a degradable polymer. Another embodiment of the present invention provides an emulsified treatment fluid. An example of such an emulsified treatment fluid may comprise an oleaginous phase, an aqueous phase, and an emulsifying agent comprising a degradable surfactant derived from a degradable polymer. Another embodiment of the present invention provides a foamed treatment fluid. In an example of such a foamed treatment fluid, the foamed treatment fluid may comprise an aqueous fluid, a gas, and a foaming agent comprising a degradable surfactant derived from a degradable polymer. The present invention relates to methods and compositions for treating subterranean formations. More particularly, the present invention relates to treatment fluids comprising degradable surfactants and associated methods of use. As used herein, the phrase “degradable surfactant” refers to surfactant molecules derived from degradable polymers, wherein the surfactant molecules contain a backbone with repeating units of degradable groups, such as esters or other derivatives, for example, such as polycarbonates, polyacetals, poly(orthoesters), or polyesteramides as the degradable hydrophobic block or tail in the surfactant molecule attached to the hydrophilic polymeric block or head group. The degradable surfactants useful in the present invention may be any suitable degradable surfactant. Suitable degradable surfactants include degradable block copolymer surfactants that comprise a hydrophilic polymeric block and a hydrophobic degradable polymeric block, degradable polymeric surfactants, and mixtures thereof. As used herein, the phrase degradable block copolymer surfactant is intended to be broad enough to include graft copolymers, as well as block copolymers. As used herein, the phrase “degradable polymeric surfactant” refers to degradable surfactants comprising a degradable hydrophobic portion (e.g, a hydrophobic block or chain) attached to a hydrophilic head group (e.g., ionic, nonionic, amphoteric, or zwitterionic). Because the degradable surfactants have built into their structure a bond with limited stability, degradation of this bond should at least partially decrease the surface activity of the surfactants. In some embodiments, the degradable surfactants may cleave at the juncture of the hydrophobic and hydrophilic polymeric block for a particular surfactant molecule, which may result in the instantaneous disappearance of the surface activity for that surfactant molecule. As a result, the degradable surfactants are capable of undergoing an irreversible degradation. The term “irreversible,” as used herein, means that the degradable surfactant should degrade in situ (e.g., within a well bore) but should not recrystallize or reconsolidate in situ after degradation. The terms “degradation” and/or “degradable” refer to the conversion of materials into smaller components, intermediates, or end products by hydrolytic degradation or by the action of biologically formed entities, such as bacteria or enzymes. “Hydrolytic degradation” refers to both heterogeneous (or bulk erosion) and homogenous (or surface erosion), and any stage of degradation between these two by the action of water on the polymer. This degradation may be the result, inter alia, of a chemical reaction, a thermal reaction, an enzymatic reaction, or a reaction induced by radiation. The degradability of the degradable surfactants used in the present invention depends, in part, on the backbone structure of the hydrophobic portion. For instance, the presence of hydrolysable and/or oxidizable linkages in the backbone often yields a degradable surfactant that will degrade as described herein. The rates at which such surfactants degrade are dependent on the type of repetitive unit, composition, sequence, length, molecular geometry, molecular weight, stereochemistry, morphology (e.g., crystallinity, size of spherulites, and orientation), hydrophilicity, hydrophobicity, surface area, and additives. Also, the environment to which the degradable surfactant is subjected may affect how it degrades, e.g., temperature, presence of moisture, oxygen, microorganisms, enzymes, pH, and the like. Upon degradation, the degradable surfactants may release a desirable degradation product, such as an acid that may be used to break a viscosified treatment fluid, degrade an acid soluble component present in the subterranean formation, or to facilitate the setting of an acid-settable resin. Among other things, degradation of the degradable surfactants may be sensitive to pH. For example, degradable surfactants comprising an aliphatic polyester hydrophobic portion degrade rapidly at a higher pH (e.g., about 9 to about 14) and may be most stable at a pH of about 6. On the other hand, degradable surfactants comprising a poly(orthoester) hydrophobic portion are stable at higher pHs, but poly(orthoesters) may degrade at pHs of about 8 or less. With an increase in temperature, the hydrolysis of the surfactant should become faster. The degradable surfactants should be suitable for use at temperatures that they will encounter during subterranean operations. Degradable surfactants containing a poly(lactic acid) hydrophobic portion are generally not suitable for use at bottom hole temperatures greater than about 150° C. However, degradable surfactants containing other hydrophobes, such as poly(caprolactone), may be suitable for use at higher bottom hole temperatures. One of ordinary skill in the art, with the benefit of this disclosure, should be able to determine the appropriate degradable surfactant to use based on, among other things, bottom hole temperatures that may be encountered. The function that a particular degradable surfactant useful in the present invention may perform depends on a variety of factors. These factors may include, but are not limited to, the choice of the hydrophobic and hydrophilic portions and the relative amounts thereof, and the presence of any cationic, ionic, non-ionic, amphoteric, or Zwitterionic groups. For example, whether an oil-in-water (“O/W”) or water-in-oil (“W/O”) emulsion is formed may be determined by the relative hydrophobicity of the degradable polymeric block or tail and the hydrophilicity of the hydrophilic polymeric block or head group. The HLB of the surfactant may provide a quantitative prediction of whether the surfactant will facilitate the formation of an O/W or a W/O emulsion. HLB is a well known system that can be determined from the chemical formula of the surfactant using empirically determined group numbers. For the degradable polymeric surfactants utilized in the present invention, the HLB may be controlled by controlling the length of the polymeric chain during the polymerization reaction. For example, where the degradable polymeric surfactant is prepared from a glycolide or a lactide, the HLB of the degradable polymeric surfactant may be controlled during the ring-opening by controlling the length of the lactide or glycolide chains. Even the HLB system is only semi-empirical, and other factors (such as the relative phase volume of oil and water) may have a considerable influence on the type of emulsion formed. By varying the above-listed factors, the specific properties of the degradable surfactants such as solubility, wettability, emulsifying, foaming, antifoaming, cloud point, gelling, solubilizing agent, and the like may be varied. For example, where used as an emulsifying agent, a degradable surfactant having an HLB of from about 3 to about 6 may be suitable to stabilize a W/O emulsion. In other embodiments, where used as an emulsifying agent, a degradable surfactant having an HLB of from about 8 to about 18 may be suitable to stabilize an O/W. Those of ordinary skill in the art, with the benefit of this disclosure, will be able to determine the appropriate degradable surfactants to use for a particular application. In some embodiments of the present invention, suitable degradable surfactants may be a degradable block copolymer surfactant that comprises a hydrophilic polymeric block and a hydrophobic degradable polymeric block. These degradable block copolymer surfactants may be prepared by any suitable process, including, but not limited to, polycondensation reactions, ring-opening polymerizations, free radical polymerizations, anionic polymerizations, cationic polymerizations, coordinative ring-opening polymerizations, hydrogen-transfer polymerization, and any other suitable process. Suitable degradable block copolymer surfactants include block copolymer surfactants, graft copolymer surfactants, and block-graft copolymer surfactants. Examples of suitable degradable block copolymer surfactants include linear diblock, triblock, or multiblock arrays, e.g., of the type A-B, A-B-A, B-A-B, A-B-A-B-A-B, (A-B)n, where A and B are hydrophilic and hydrophobic degradable polymeric blocks, respectively, and n is any integer greater than or equal to 1. 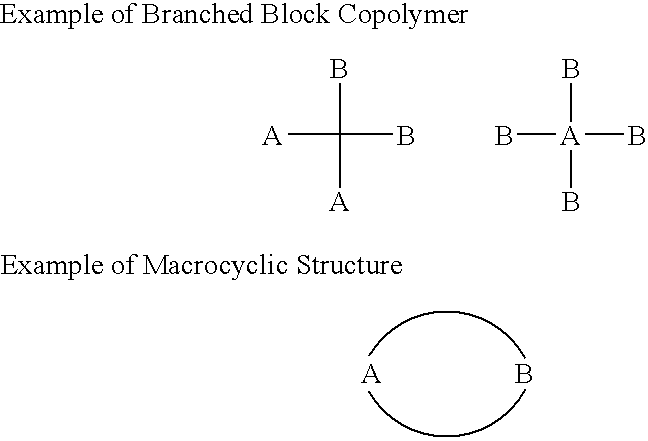 Degradable block copolymer surfactants of branched structure and macrocyclic structures, such as those depicted below, may also be suitable for use in the present invention. Suitable degradable block copolymer surfactants also may include graft copolymers and block-graft copolymers. An example structure for a block-graft copolymer is listed below. In one embodiment, a suitable graft copolymer surfactant may comprise a hydrophilic polymeric backbone having branches of a hydrophobic degradable polymeric block along its length, for example, guar grafted with polylactic acid or poly(caprolactone). In another embodiment, a suitable graft copolymer surfactant may comprise a hydrophobic degradable polymeric backbone having branches of a hydrophilic polymer along its length. The hydrophilic polymeric block of the degradable block copolymer surfactants may comprise any suitable degradable or non-degradable hydrophilic polymer, including, but not limited to, poly(alkylene glycols) (e.g., poly(ethylene glycol)), poly(alcohols) (e.g., poly(vinyl alcohols)), poly(vinyl pyrrolidone), polysaccharides (e.g., dextran, cellulose, guar, starch, xanthan, etc. ), chitins, chitosans, proteins, poly(amino acids) (e.g., poly(aspartic acid)), poly(alkylene oxides) (e.g., poly(ethylene oxides)), poly(amides) (e.g., poly(acrylamide)), poly(acids) (e.g., poly(acrylic acid)), polyols (e.g., sorbitol, glucose, fructose, mannose, etc. ), and blends and copolymers thereof. The term “copolymer” as used herein is not limited to combinations of two polymers, but includes any combination of polymers, e.g., terpolymers and the like. In certain embodiments, the hydrophilic polymer block comprises a poly(akylene glycol), such as poly(ethylene glycol). In certain embodiments, the hydrophilic block comprises a poly(alkylene oxide), such as poly(ethylene oxide). Generally, the hydrophilic polymeric block of the degradable block copolymer surfactant may have a number average molecular weight in the range of from about 50 Daltons to about 6,000,000 Daltons. One of ordinary skill in the art, with the benefit of this disclosure, will be able to determine the appropriate number average molecular weight for the hydrophilic polymeric block based on a variety of factors, including the desired hydrophilic/lipophilic balance (“HLB”) and the particular function the degradable surfactant will perform. The hydrophobic degradable polymeric block of the degradable block copolymer surfactants may include any suitable polyester, or other derivative, including, but not limited to, poly(anhydrides), poly(orthoesters), poly(lactic acids), poly(glycolic acids), poly(caprolactones), poly(hydroxybutyrates), polyphosphazines, poly(carbonates), polyacetals, polyetheresters, polyesteramides, polycyanoacrylates, polyurethanes, polyacrylates, and blends and copolymers thereof. In certain embodiments, the hydrophobic degradable polymeric block comprises a poly(lactic acid). As used herein, “poly(lactic acid)” refers to a polymer that may be synthesized from lactic acid by a condensation reaction, or more commonly by ring-opening polymerization of a cyclic lactide monomer, and is sometimes referred to as “PLA,” “polylactate,” or “polylactide.” In certain embodiments, the hydrophobic degradable polymeric block comprises a poly(caprolactone). Because poly(caprolactone) has five methylene groups in its monomeric segment, it is generally more hydrophobic than poly(lactic acid) and thus may be more suitable for forming an oil-soluble block where desired. Polyamides and polyurethanes are typically susceptible to hydrolytic and enzymatic hydrolysis of, for example, of their amide and urethane groups. Suitable aliphatic polyesters may, for example, comprise or be substituted with hydrophobic groups, such as alkyl, aralkyl, or aryl groups, to increase their hydrophobicity if desired. In some embodiments, a suitable hydrophobic degradable polymeric block of the degradable block copolymer surfactant may have a number average molecular weight in the range of from about 500 Daltons to about 5,000 Daltons. In other embodiments, a suitable hydrophobic degradable polymeric block of the degradable block copolymer surfactant may have a number average molecular weight in the range of from about 1,000 Daltons to about 20,000 Daltons. One of ordinary skill in the art, with the benefit of this disclosure, will be able to determine the appropriate number average molecular weight for the hydrophobic degradable polymeric block based on a variety of factors, including the desired hydrophilic/lipophilic balance and the particular function for the surfactant to perform. To obtain a surfactant suitable for a particular application, the proportion of a hydrophilic polymeric block to a hydrophobic degradable polymeric block in a degradable block copolymer surfactant of the present invention may be modified, inter alia, based on the desired functionality of the degradable block copolymer surfactant. In some embodiments of the present invention, the hydrophilic polymeric block is present in a degradable block copolymer surfactant in an amount in the range of from about 5% to about 95% by weight of the surfactant, and the hydrophobic degradable polymeric block is present in the degradable block copolymer surfactant in an amount in the range of from about 5% to about 95% by weight of the surfactant. One example of a suitable degradable block copolymer surfactant is an A-B diblock copolymer of poly(ethylene glycol)methyl ether and poly(lactic acid). Another example of a suitable degradable block copolymer surfactant is an A-B-A triblock copolymer of poly(ethylene glycol) and poly(lactic acid). Another example of a suitable degradable block copolymer surfactant is an A-B diblock or an A-B-A triblock copolymer of poly(lactide-co-glycolide) and poly(ethylene glycol) with an ionizable group on each end of the polymer chain. Another example of a suitable degradable block copolymer surfactant is a block copolymer of poly(ethylene glycol)methyl ether and poly(ε-caprolactone). Another example of a suitable degradable block copolymer surfactant is a triblock copolymer of poly(ethylene glycol) and poly(ε-caprolactone). The degradable block copolymer surfactants useful in the present invention further may be modified to be ionic, cationic, anionic, amphoteric, or Zwitterionic, if desired. In some embodiments, at least a portion of a degradable block copolymer surfactant may be modified. These ionic, cationic, anionic, amphoteric, or Zwitterionic groups may be added to the ends or sides of the hydrophilic polymeric block or the hydrophobic degradable polymeric block. Non-ionic groups also may be added to the ends or sides of the hydrophilic polymeric block or the hydrophobic degradable polymeric block. In certain embodiments, suitable degradable block copolymer surfactants further may comprise a terminal acid group, an alcohol group, an amine group, or a tertiary amine group attached to the hydrophilic or hydrophobic degradable polymeric block. wherein R1 is a methylene chain of from 1 to 4 carbons, alkyl, hydroxyl alkyl, ethoxylated alkyl, or arylalkyl group; R2 is an alkyl, hydroxyl alkyl, ethoxylated alkyl, or arylalkyl group; R3 is an alkyl, hydroxyl alkyl, ethoxylated alkyl, or an arylalkyl group; R4 is an alkyl, hydroxyl alkyl, ethoxylated alkyl, or an arylalkyl group; and X is a chlorine, bromine, iodine, ½SO4, HSO4, CH3SO3, or the like. A and B may be hydrophilic and hydrophobic degradable polymeric blocks, respectively, as described previously. wherein R1 is a methylene chain of from 1 to 4 carbons, alkyl, hydroxyl alkyl, ethoxylated alkyl, or arylalkyl group; R2 is an alkyl, hydroxyl alkyl, ethoxylated alkyl, or arylalkyl group; R3 is an alkyl, hydroxyl alkyl, ethoxylated alkyl, or an arylalkyl group; R4 is an alkyl, hydroxyl alkyl, ethoxylated alkyl, or an arylalkyl group; R5 is a methylene chain of from 1 to 4 carbons, alkyl, hydroxyl alkyl, ethoxylated alkyl, or arylalkyl group; X is a chlorine, bromine, iodine, ½SO4, HSO4, CH3SO3, or the like. A and B may be hydrophilic and hydrophobic degradable polymeric blocks, respectively, as described previously. Examples of suitable anionic groups that may be added to the hydrophilic polymeric block or as a head group to the hydrophobic degradable polymeric block include, but are not limited to, carboxylate groups, phosphate groups, phosphonate groups, sulfate groups, sulfonate groups, and their salts. Examples of suitable non-ionic groups that may be added to the hydrophilic polymeric block or as a head group to the hydrophobic degradable polymeric block include, but are not limited to, carboxylic acid (low pH), alcohol, polyols, sugars (e.g., sorbitan, sorbitol), and amines (neutral and high pH). In yet other embodiments, charged groups may be added to both the hydrophobic block and the hydrophobic degradable polymeric block of the degradable block copolymer surfactants. In yet another embodiment, the degradable block copolymer surfactants may be made amphoteric by the incorporation of groups such as amine alkanoates (e.g., betaines) or alkyl amine oxides into the degradable block copolymer surfactant. In some embodiments, amphoteric surfactants may be desirable, among other things, due to their compatibility with other surfactants, low skin and eye irritation, absorbability onto both positively and negatively charged surfaces, and low solubility in organic solvents. Similarly, in another embodiment, a suitable B-A-B triblock copolymer surfactant of poly(ethylene glycol) and poly(ε-caprolactone) that contains a terminal acid group may be prepared as illustrated below. wherein R1 is a hydrogen, alkyl, aryl, alkylaryl, acetyl, or heteroatoms; R2 is a hydrogen, alkyl, aryl, alkylaryl, acetyl, or heteroatoms; R3 is hydrogen, alkyl, aryl, alkylaryl, acetyl, alkoxyl, benzoyl, or heteroatoms; or a group comprising an anionic group, a cationic group, or a non-ionic group; R4 is a group such as H, Na, K, or Li, or a group comprising an anionic group, a cationic group, or a non-ionic group; n can be 0 or 1; m can be an integer between 1 and 20; and X can be an integer between 10 and 10,000. The above formula represents a non-limiting example of a suitable degradable polymeric surfactant and numerous other embodiments of degradable polymeric surfactants are suitable for use in the present invention. 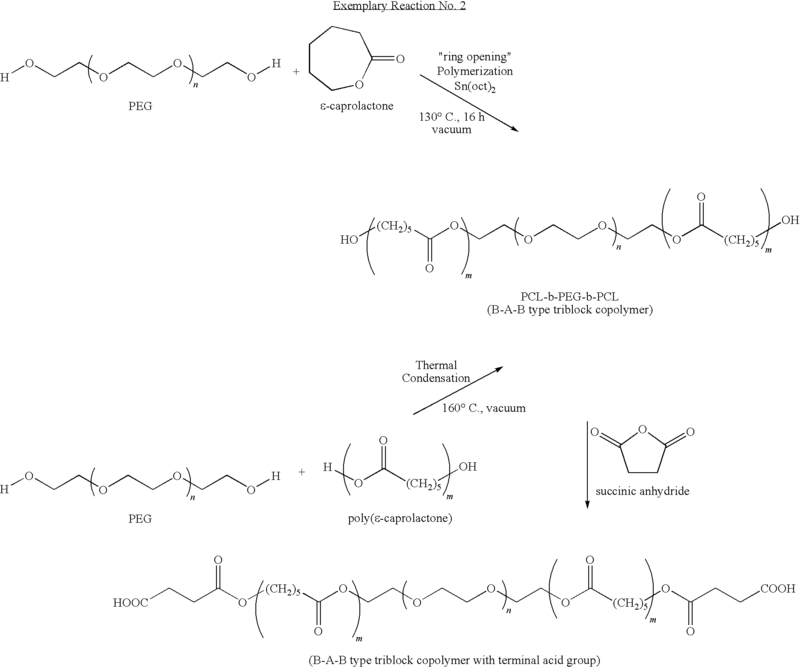 Suitable examples of degradable polymers that may be used in the preparation of the degradable polymeric surfactants may include any suitable polyester, or other derivative, including, but not limited to, poly(anhydrides), poly(orthoesters), poly(lactic acid), poly(glycolic acids), poly(caprolactones), poly(hydroxybutyrates), polyphosphazines, poly(carbonates), polyacetals, polyetheresters, polyesteramides, polycyanocarlyates, polyurethanes, polyacrylates, and blends and copolymers thereof. In certain embodiments, the hydrophobic degradable polymeric block comprises a poly(lactic acid). In certain embodiments, the hydrophobic degradable polymeric block comprises a poly(caprolactone). Because poly(caprolactone) has five methylene groups in its monomeric segment, it is generally more hydrophobic than poly(lactic acid) and thus may be more suitable for forming an oil-soluble block where desired. Polyamides and polyurethanes are typically susceptible to hydrolytic and enzymatic hydrolysis, for example, of their amide and urethane groups. Such aliphatic polyesters may, for example, comprise or be substituted with hydrophobic groups, such as alkyl, aralkyl, or aryl groups, to increase their hydrophobicity if desired. The degradable polymeric surfactants of the present invention may be formed by any suitable process, including, but not limited to, polycondensation reactions, ring-opening polymerizations, free radical polymerizations, anionic polymerizations, cationic polymerizations, coordinative ring-opening polymerizations, hydrogen-transfer polymerization, and any other suitable process. Ionic (e.g., cationic or anionic), non-ionic, amphoteric, or Zwitterionic head groups may be added to the aliphatic polyester prior to or after the process to form the degradable polymeric surfactant. 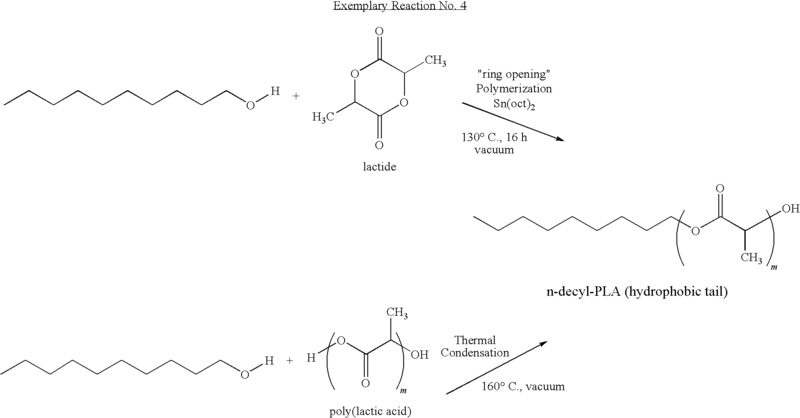 The following exemplary reaction illustrates the preparation of a suitable degradable polymer with a hydrophobic end tail from a lactide or a poly(lactic acid) suitable for conversion to a degradable polymeric surfactant. In some embodiments, the degradable polymeric surfactant may be a reaction product of a ring-opening polymerization reaction of a nucleophile with a cyclic lactone (e.g., a lactide, a glycolide, or a caprolactone). The nature of the nucleophile, e.g., whether it contains anionic, cationic, or non-ionic groups, may further help to control the functionality of the degradable polymeric surfactant. Examples of suitable cationic groups that may be added to the degradable polymeric surfactants include, but are not limited to, pyridinium group, primary secondary or tertiary amines that are protonated at low or middle pH ranges, and quaternary ammonium compounds and salts thereof. 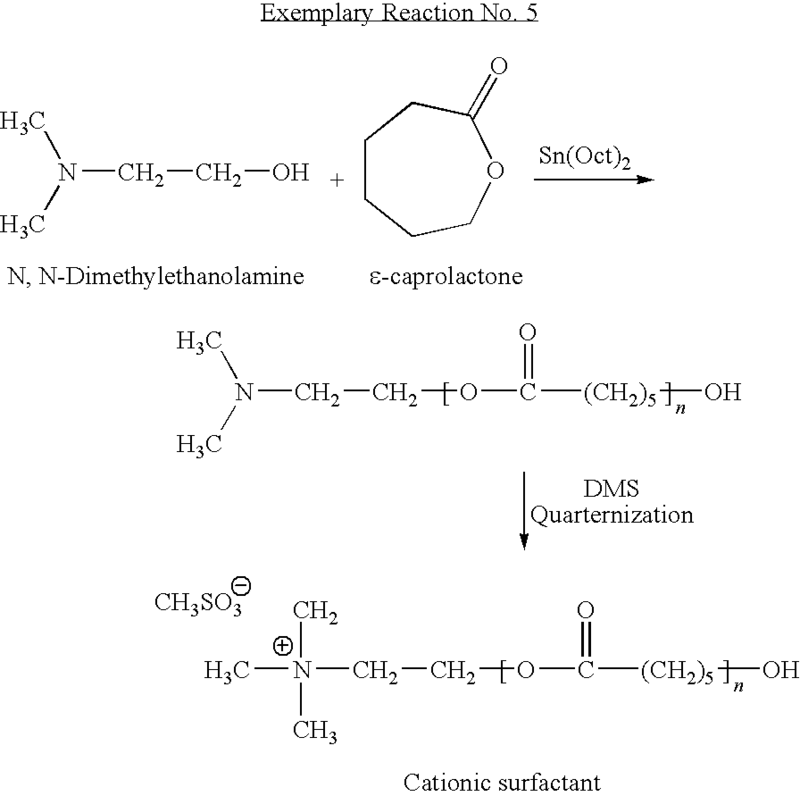 The following example illustrates the ring-opening reaction of α-caprolactone by N,N-dimethylethanolamine in the presence of a catalytic amount of tinoctoate and the subsequent quaterniztion of the reaction product to yield a quaternary amine cationic surfactant. Examples of suitable anionic groups that may be added to the degradable polymeric surfactants include, but are not limited to, carboxylate groups, phosphate groups, phosphonate groups, sulfate groups, sulfonate groups, and their salts. For example, the head group may comprise a salt of a carboxylic acid. 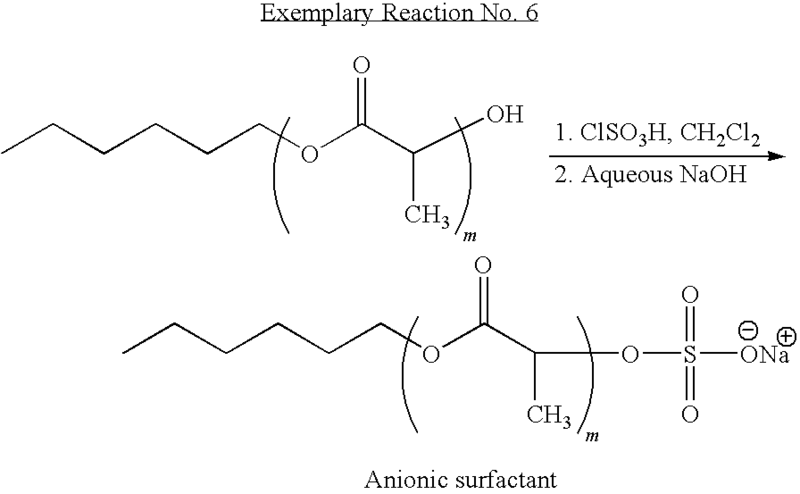 A sulfate group may be incorporated into the degradable polymeric surfactant as depicted in the example reaction below. The molecular weight of the degradable hydrophobic portion (e.g, a hydrophobic block or chain) may be controlled to provide a degradable polymeric surfactant with a molecular weight suitable for a particular application. In some embodiments, the molecular weight of the degradable hydrophobic portion may be in the range of from about 200 Daltons to about 50,000 Daltons. In another embodiment, the molecular weight of the degradable hydrophobic portion may be in the range of from about 1,000 Daltons to about 20,000 Daltons. The treatments fluids of the present invention may comprise an aqueous fluid and a degradable surfactant. Generally, the degradable surfactants may be included in any treatment fluid suitable for any of a variety of subterranean treatments, including, but not limited to, drilling operations, stimulation treatments (e.g., fracturing treatments, acidizing treatments), and completion operations (e.g., sand control treatments). These treatment fluids may include aqueous fluids, aqueous gels, viscoelastic surfactant gels, oil gels, foamed gels, and emulsions (e.g., W/O or O/W). Among other things, the degradable surfactants may be included in the treatment fluids for any of a number of purposes, including to act at least partially as emulsifying agents, non-emulsifying agents, foaming agents, defoaming agents, viscosifying (or gelling) agents, dispersants, wetting agents, combinations thereof, and the like. Suitable aqueous fluids may include, but are not limited to, freshwater, seawater, saltwater (e.g., saturated or unsaturated), and brines (e.g., saturated saltwater). The aqueous fluid may be from any source, provided that it does not adversely affect the stability of the foamed treatment fluids of the present invention. The appropriate amount of the degradable surfactant to include in the treatment fluids of the present invention will vary depending upon the particular application. For example, in certain embodiments, such as foaming, emulsifying, or wetting, the degradable surfactants may be present in the treatment fluids of the present invention in an amount in the range of from about 0.01% to about 10% by weight. In another embodiment, such as viscosifying, the degradable surfactant may be present in the treatments fluids of the present invention in an amount up to about 40% by weight of the treatment fluid. One of ordinary skill in the art, with the benefit of this disclosure, will be able to determine the appropriate amount of the degradable surfactant to include in the treatments fluids for a particular application. For the emulsifying embodiments, the treatment fluids of the present invention may be an emulsified treatment fluid, the emulsified treatment fluid comprising an oleaginous phase, an aqueous phase, and an emulsifying agent that comprises a degradable surfactant. As referred to herein, the phrase “emulsified treatment fluid” refers to any subterranean treatment fluid that has a continuous phase and a discontinuous phase, such as a W/O emulsion or an O/W emulsion. In an O/W emulsion, the aqueous phase is the continuous (or external) phase and the oleaginous phase is the discontinuous (or internal) phase. In a W/O emulsion (or invert emulsion), the aqueous phase is the discontinuous phase and the oleaginous phase is the continuous phase. Generally, the emulsified treatment fluids of the present invention are suitable for use in a variety of subterranean treatments where an O/W emulsion or a W/O emulsion is suitable. The oleaginous phase of the emulsified treatment fluids of the present invention may comprise any oleaginous fluid suitable for use in emulsions used in subterranean treatments. The oleaginous fluid may be from natural or synthetic sources. Examples of suitable oleaginous fluids include, but are not limited to, α-olefins, internal olefins, alkanes, aromatic solvents, cycloalkanes, liquefied petroleum gas, kerosene, diesel oils, crude oils, gas oils, fuel oils, paraffin oils, mineral oils, low-toxicity mineral oils, olefins, esters, amides, synthetic oils (e.g., polyolefins), polydiorganosiloxanes, siloxanes, organosiloxanes, ethers, acetals, dialkylcarbonates, hydrocarbons, and combinations thereof. For the emulsifying embodiments, the aqueous phase may comprise an aqueous fluid. Suitable aqueous fluids may include, but are not limited to, freshwater, seawater, saltwater (e.g., saturated or unsaturated), and brines (e.g., saturated saltwater). The aqueous fluid may be from any source, provided that it does not adversely affect the stability of the emulsified treatment fluids of the present invention. Because the emulsifying agents comprising the degradable surfactants act to stabilize the emulsified treatment fluids of the present invention, the emulsified treatment fluids should have a delayed break, due to the degradation of the surfactants therein, without the need for the inclusion of conventional emulsion breakers (e.g., acid or base precursors). Separation of the two phases of the emulsion is generally referred to as “breaking” the emulsion. However, in some embodiments, an enzyme breaker (e.g., Lipase, alphas and beta amylases, invertase, maltase, cellulase, hemicellulase, and the like) or any other suitable breaker may be used to facilitate the degradation of the degradable surfactants (by degradation of the degradable hydrophobic portion or the cleavage of the hydrophobic chain from the hydrophilic polymeric block) and thus the breaking of the emulsified treatment fluids of the present invention. Depending on the particular application, the enzyme breaker may be included in the emulsified treatment fluids of the present invention or the emulsified treatment fluid may be contacted by the enzyme breaker subsequent to introduction into the well bore. Depending on the particular application, the emulsified treatment fluids of the present invention may further comprise any of a variety of additional additives. Examples of suitable additives include, but are not limited to, proppant particulates, gravel particulates, weighting agents, organophilic clays, bridging agents, fluid loss control agents, wetting agents, combinations thereof, and the like. Individuals skilled in the art, with the benefit of this disclosure, will recognize the types of additives to include for a particular application. The emulsified treatment fluids of the present invention may be used in any suitable subterranean treatment where an emulsion may be used, including, but not limited to, drilling operations (e.g., as a drilling fluid or a drill-in fluid), fracturing treatment (e.g., as a fracturing fluid), well bore cleanups, viscous sweeps, and sand control treatments (e.g., as a gravel packing fluid). An example method of the present invention of treating a subterranean formation comprises: providing an emulsified treatment fluid of the present invention that comprises a degradable surfactant, an oleaginous phase, and an aqueous phase; and introducing the emulsified treatment fluid into a well bore that penetrates the subterranean formation. For the foaming embodiments, the treatment fluids of the present invention may be a foamed treatment fluid, the foamed treatment fluid comprising an aqueous fluid, a gas, and a foaming additive that comprises a degradable surfactant. Suitable aqueous fluids may include, but are not limited to, freshwater, seawater, saltwater (e.g., saturated or unsaturated), and brines (e.g., saturated saltwater). The aqueous fluid may be from any source, provided that it does not adversely affect the stability of the foamed treatment fluids of the present invention. The gas included in the treatment fluids of the present invention may be any gas suitable for foaming a treatment fluid, including, but not limited to, nitrogen, carbon dioxide, and air, and derivatives thereof and combinations thereof. Generally, the gas should be present in the foamed treatment fluids of the present invention in an amount sufficient to form a foam. In certain embodiments, the gas may be present in the foamed treatment fluids of the present invention in an amount in the range of from about 5% to about 95% by volume of the foamed treatment fluid, exclusive of the volume of the gas. As will be recognized by those of ordinary skill in the art, with the benefit of this disclosure, a wide variety of additional additives may be included in the foamed treatment fluids of the present invention. Examples of suitable additives include, but are not limited to, gelling agents, gel breakers, proppant particulates, gravel particulates, defoaming agents, clay stabilizers, scale inhibitors, fluid loss control additives, and combinations thereof. The foamed treatment fluids of the present invention may be used in any suitable subterranean treatment where a foamed treatment fluid emulsion may be used, including, but not limited to, drilling operations (e.g., as a drilling fluid or a drill-in fluid), fracturing treatment (e.g., as a fracturing fluid), well bore cleanups, and sand control treatments (e.g., as a gravel packing fluid). An example method of the present invention of treating a subterranean formation comprises: providing a foamed treatment fluid of the present invention that comprises an aqueous fluid, a gas, and a foaming agent that comprises a degradable surfactant; and introducing the foamed treatment fluid into a well bore that penetrates the subterranean formation. An embodiment of the present invention provides a method of treating a subterranean formation. In an example of such a method, the method may comprise providing a treatment fluid comprising an aqueous fluid, and a degradable surfactant derived from a degradable polymer; and introducing the treatment fluid into a well bore that penetrates the subterranean formation. In certain embodiments, the treatment fluid may be introduced into the well bore at a pressure sufficient to create or enhance at least one fracture in the subterranean formation. Another embodiment of the present invention provides a method of treating a subterranean formation. In an example of such a method, the method may comprise providing an emulsified treatment fluid comprising an oleaginous phase, an aqueous phase, and an emulsifying agent comprising a degradable surfactant derived from a degradable polymer; and introducing the emulsified treatment fluid into a well bore that penetrates the subterranean formation. Another embodiment, the present invention provides a method of treating a subterranean formation. In an example of such a method, the method may comprise providing a foamed treatment fluid comprising an aqueous fluid, a gas, and a foaming agent comprising a degradable surfactant derived from a degradable polymer; and introducing the emulsified treatment fluid into a well bore that penetrates the subterranean formation. Samples of degradable block copolymer surfactants comprising a hydrophilic A block and a hydrophobic degradable polymeric B block were synthesized using known literature procedures. 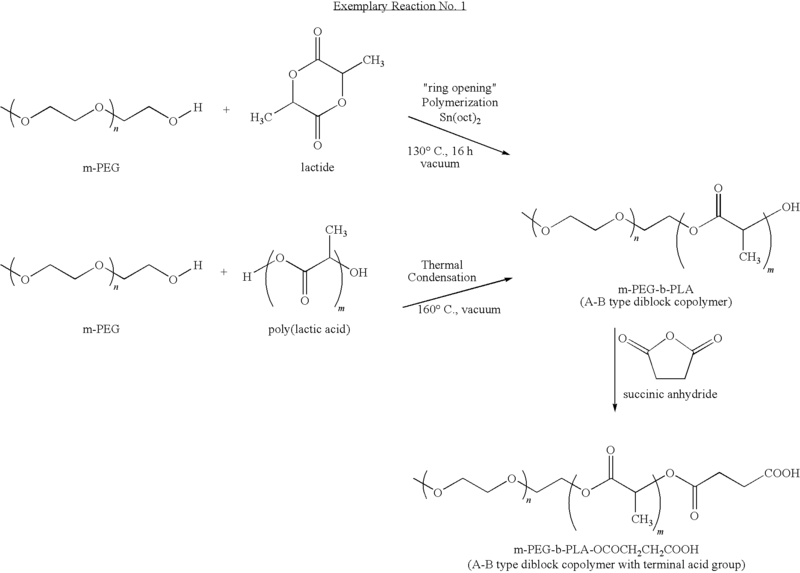 Polymerization of a monomethoxypolyethylene glycol-poly(lactide) (mPEG-PLA) block copolymer (A-B type) was performed according to the following procedure. Poly(ethylene glycol)methyl ether (Mn: 5,000 Daltons) in an amount of 10 grams was introduced into a flame-dried 100 ml two-neck round-bottomed flask, and dehydrated by heating in an oil bath to 130° C. under reduced pressure (1 ml Hg) for 2 hours. The reaction flask was filled with argon and crystallized lactide (10.08 g, 0.07 mol) was added to the flask. The mixture was stirred for 30 minutes with a magnetic stirrer. To this mixture was injected stannous octoate (0.28 g, 0.7 mmol) in 0.3 ml of dry toluene. The mixture was stirred for 10 minutes, and a vacuum was applied to remove the toluene. After the toluene's removal, the mixture was heated under argon at 130° C. for 16 hours. The polymer formed upon cooling was dissolved in dichloromethane (125 ml) and ether was added to precipitate the polymer. The precipitate obtained was filtered and dried in a vacuum oven for 48 hours to afford 18 grams of Copolymer No. 1. The mPEG-PLA copolymer obtained had a number average molecular weight of 5,000-5,000 Daltons. Additional samples of MPEG-PLA copolymers were prepared utilizing the above procedures. To obtain samples with varying molecular weights and block length of the hydrophobe, the mole ratio of crystallized lactide to the monomethoxypolyethylene glycol were varied to control the length of the hydrophobic (B block) so as to provide a series of polymers. Accordingly, Copolymer No. 2 was a mPEG-PLA block copolymer having a number average molecular weight of 5,000-3,000 Daltons. Copolymer No. 3 was a MPEG-PLA block copolymer having a number average molecular weight of 5,000-1,500 Daltons. Copolymer No. 4 was a mPEG-PLA block copolymer having a number average molecular weight of 350-2,000 Daltons. And Copolymer No. 5 was a MPEG-PLA block copolymer having a number average molecular weight of 5,000-15,000 Daltons. Additionally, polymerization of a monomethoxypolyethylene glycol-poly(β-caprolactone) (mPEG-PCL) block copolymer (A-B type) also was performed according to the above procedure. However, instead of lactide, ε-caprolactone was used. Accordingly, Copolymer No. 6 was a mPEG-PCL copolymer having a number average molecular weight of 350-1,500 Daltons. And Copolymer No. 7 was a mPEG-PCL copolymer having a number average molecular weight of 350-1,500 Daltons. The samples that were synthesized according to the above procedures are shown below in Table 1. Emulsions were prepared utilizing the sample copolymers that were prepared in Example 1. Copolymer No. 1 in an amount of 2 grams was dissolved in 25 ml of water. To this solution, 96 ml of dodecane was added and the resulting solution was stirred with a mixer (Silverson L4RT-W) for about 1 minute. An O/W emulsion was observed to have formed that stuck to the propeller of the mixer. After mixing, to test the emulsion, it was dropped into a beaker that contained water and dodecane, as separate phases. The gel dispersed in the water but not in the dodecane, confirming an O/W emulsion. Furthermore, this emulsion was stable at room temperature for multiple days. The emulsion was heated to 80° C. After four hours at this temperature, a portion of the dodecane separated and complete separation of the two phases was observed after 24 hours. According to the above procedure, O/W emulsions were also formed utilizing 1 gram of Copolymer Nos. 2 and 3, respectively. W/O emulsions were also prepared utilizing Copolymer No. 6 that was prepared in Example 1. Copolymer No. 6 in an amount of 1 gram was dissolved in a 10 ml mixture that comprises toulene and dodecane in a 1:1 ratio by weight. To this solution, 30 ml of water was added, and the resulting solution was stirred with the mixer for about 1 minute to form a W/O emulsion. Therefore, Example 2 indicates that degradable surfactants useful in the present invention comprising a block copolymer comprising a hydrophobic degradable polymeric block and a hydrophilic polymeric block may be used to form stable emulsions. Foams were prepared utilizing the copolymers that were prepared in Example 1. Copolymer No. 1 in an amount of 1.8 grams was dissolved in 800 grams of water. The resulting solution was stirred in a foam blender for 2 minutes to form a foam. The foamed solution was poured into a beaker and allowed to settle. The foam completely disappeared in 2 hours. To determine tolerance to calcium ions, 2 grams of calcium chloride was then added to the sample. After the addition of the calcium chloride, the solution was stirred in the foam blender for two minutes. The solution containing calcium chloride foamed. Foams were also prepared using Copolymers Nos. 2, 3, 5, and 6. Accordingly, Example 3 indicates that degradable surfactants useful in the present invention comprising a block copolymer comprising a hydrophobic degradable polymeric block and a hydrophilic polymeric block may be used to form foams. The following example was performed to determine the water drainage from a foam prepared using Copolymer No. 2 that was prepared in Example 1. For this example, Copolymer No. 2 in an amount of 1 gram was dissolved in 500 ml of water. The resulting solution was stirred in a jar at 12,000 rpm to form a foam. The resulting foam was then transferred to a 1-liter graduated cylinder, and the drainage of water at the bottom of the graduated cylinder was measured for a period of 10 minutes. The above procedure was repeated utilizing PLURONIC® F108, an ethylene oxide-propylene oxide-ethylene oxide block copolymer that is commercially available from BASF Corporation, Florham Park, N.J. The results of Example 4 are shown below in Table 2. Accordingly, Example 4 indicates that degradable surfactants useful in the present invention comprising a block copolymer comprising a hydrophobic degradable polymeric block and a hydrophilic polymeric block may be used to form foams. 1. A treatment fluid for treating a subterranean formation, the treatment fluid comprising an aqueous fluid and a degradable surfactant derived from a degradable polymer, wherein the degradable surfactant is not a phosphate ester and wherein the degradable surfactant has a hydrophilic/lipophilic balance that facilitates the formation of an emulsion. 2. The treatment fluid of claim 1 wherein the degradable surfactant comprises a degradable block copolymer surfactant that comprises a hydrophilic polymeric block and a hydrophobic degradable polymeric block. 3. The treatment fluid of claim 2 wherein the degradable block copolymer surfactant comprises a hydrophilic polymeric backbone grafted with a polylactic acid or a poly(caprolactone). 4. 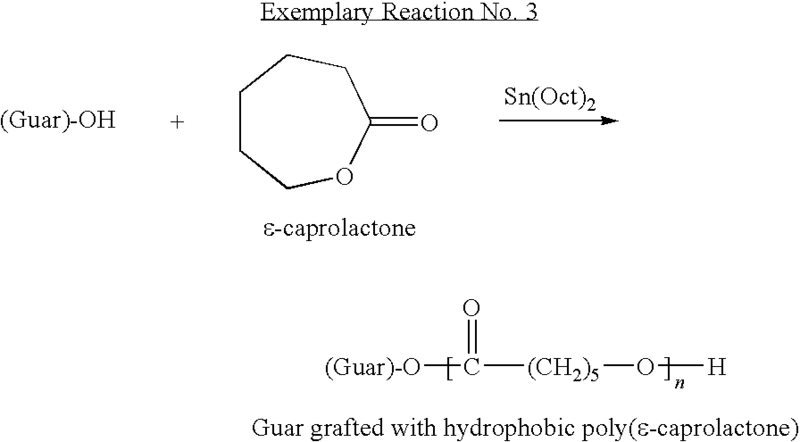 The treatment fluid of claim 3 wherein the hydrophilic polymeric backbone comprises guar. 5. The treatment fluid of claim 2 wherein the degradable block copolymer surfactant comprises a block copolymer of a poly(alkylene glycol) or a poly(alkylene oxide), and an aliphatic polyester. 6. The treatment fluid of claim 2 wherein the degradable block copolymer surfactant comprises a quaternary ammonium degradable block copolymer salt. 7. The treatment fluid of claim 1 wherein the degradable surfactant comprises a degradable polymeric surfactant that comprises an aliphatic polyester tail and a hydrophilic head group. 8. The treatment fluid of claim 7 wherein the degradable surfactant is formed from a reaction that comprises at least one of the following: a poly(anhydride); a poly(orthoester); a poly(lactic acid); a poly(glycolic acid); a poly(caprolactone); a poly(hydroxybutyrate); a polyphosphazine; a poly(carbonate); a polyacetal; a polyetherester; a polyesteramide; a polycyanoacrylate; a polyurethane; a polyacrylate; or a copolymer thereof. 9. The treatment fluid of claim 7 wherein the degradable polymeric surfactant comprises a quaternary amine cationic surfactant. 10. The treatment fluid of claim 7 wherein the hydrophilic head group is an anionic group, a cationic group, an amphoteric group, a Zwitterionic group, or a non-ionic group. 11. The treatment fluid of claim 7 wherein the degradable polymeric surfactant comprises poly(lactic) acid or poly(caprolactone) with a head group that comprises a salt of a carboxylic acid. wherein R1 is a hydrogen, an alkyl, an aryl, an alkylaryl, an acetyl, or a heteroatom; R2 is a hydrogen, an alkyl, an aryl, an alkylaryl, an acetyl, or a heteroatom, R3 is a hydrogen, an alkyl, an aryl, an alkylaryl, an acetyl, an alkoxyl, a benzoyl, a heteroatom or a group comprising an anionic group, a cationic group, or a non-ionic group; R4 is a H, a Na, a K, or a Li, or a group comprising an anionic group, a cationic group, or a non-ionic group; n is 0 or 1; m is an integer between 1 and 20; and X is an integer between 10 and 10,000. 13. The treatment fluid of claim 1 wherein the hydrophilic/lipophilic balance is from about 3 to about 6 or from about 8 to about 18. 14. The treatment fluid of claim 1 wherein the degradable surfactant comprises a degradable hydrophobic block attached to a hydrophilic polymeric block, the degradable hydrophobic block comprising at least one compound selected from the group consisting of: a poly(anhydride); a poly(orthoester); a poly(lactic acid); a poly(glycolic acid); a poly(caprolactone); a poly(hydroxybutyrate); a polyphosphazine; a poly(carbonate); a polyacetal; a polyetherester; a polyesteramide; a polycyanoacrylate; a polyurethane; a polyacrylate; and a copolymer thereof, the hydrophilic polymeric block comprising at least one compound selected from the group consisting of: a poly(alkylene glycol); a poly(alcohol); poly(vinyl pyrrolidone); a polysaccharide; a chitin; a chitosan; a protein; a poly(amino acid); a poly(alkylene oxide); a poly(amide); a poly(acid); a polyol; and a copolymer thereof. 15. An emulsified treatment fluid comprising an oleaginous phase, an aqueous phase, and an emulsifying agent comprising a degradable surfactant derived from a degradable polymer, wherein the degradable surfactant is not a phosphate ester. 16. The emulsified treatment fluid of claim 15 wherein the degradable surfactant comprises a degradable block copolymer surfactant that comprises a hydrophilic polymeric block and a hydrophobic degradable polymeric block. 17. The emulsified treatment fluid of claim 16 wherein the degradable block copolymer surfactant comprises a block copolymer of a poly(alkylene glycol) or a poly(alkylene oxide), and an aliphatic polyester. 18. The emulsified treatment fluid of claim 15 wherein the degradable surfactant has a hydrophilic/lipophilic balance of from about 3 to about 6 or from about 8 to about 18. 19. The emulsified treatment fluid of claim 15 wherein the degradable surfactant comprises a degradable hydrophobic block attached to a hydrophilic polymeric block, the degradable hydrophobic block comprising at least one compound selected from the group consisting of: a poly(anhydride); a poly(orthoester); a poly(lactic acid); a poly(glycolic acid); a poly(caprolactone); a poly(hydroxybutyrate); a polyphosphazine; a poly(carbonate); a polyacetal; a polyetherester; a polyesteramide; a polycyanoacrylate; a polyurethane; a polyacrylate; and a copolymer thereof, the hydrophilic polymeric block comprising at least one compound selected from the group consisting of: a poly(alkylene glycol); a poly(alcohol); poly(vinyl pyrrolidone); a polysaccharide; a chitin; a chitosan; a protein; a poly(amino acid); a poly(alkylene oxide); a poly(amide); a poly(acid); a polyol; and a copolymer thereof. 20. A foamed treatment fluid comprising an aqueous fluid, a gas, and a foaming agent comprising a degradable surfactant derived from a degradable polymer, wherein the degradable surfactant is not a phosphate ester and wherein the degradable surfactant has a hydrophilic/lipophilic balance that facilitates the formation of an emulsion. 21. The foamed treatment fluid of claim 20 wherein the degradable surfactant comprises a degradable block copolymer surfactant that comprises a hydrophilic polymeric block and a hydrophobic degradable polymeric block. 22. The foamed treatment fluid of claim 21 wherein the degradable block copolymer surfactant comprises a block copolymer of a poly(alkylene glycol) or a poly(alkylene oxide), and an aliphatic polyester. 23. The foamed treatment fluid of claim 20 wherein the hydrophilic/lipophilic balance is from about 3 to about 6 or from about 8 to about 18. 24. The foamed treatment fluid of claim 20 wherein the degradable surfactant comprises a degradable hydrophobic block attached to a hydrophilic polymeric block, the degradable hydrophobic block comprising at least one compound selected from the group consisting of: a poly(anhydride); a poly(orthoester); a poly(lactic acid); a poly(glycolic acid); a poly(caprolactone); a poly(hydroxybutyrate); a polyphosphazine; a poly(carbonate); a polyacetal; a polyetherester; a polyesteramide; a polycyanoacrylate; a polyurethane; a polyacrylate; and a copolymer thereof, the hydrophilic polymeric block comprising at least one compound selected from the group consisting of: a poly(alkylene glycol); a poly(alcohol); poly(vinyl pyrrolidone); a polysaccharide; a chitin; a chitosan; a protein; a poly(amino acid); a poly(alkylene oxide); a poly(amide); a poly(acid); a polyol; and a copolymer thereof. Amiji, M., et al. ; "Prevention of Protein Adsorption and Platelet Adhesion on Surfaces by PEO/PPO/PEO Triblock Copolymers"; Biomaterials; No. 10., p. 682-92, 1992. Anderson, B.C. et al. ; "Understanding drug release from poly(ethylene oxide)-b-poly(propylene oxide)-b-poly(ethylene oxide) gels"; J Control Release; vol. 70, No. 1-2; pp. 157-67, Jan. 29, 2001. Black, Fiona E. et al. ; "Surface engineering and surface analysis of a biodegradable polymer with biotinylated end groups"; Langmuir; vol. 15, No. 9; pp. 3157-3161, 1999. Dennis Discher et al. ; "Polymer Vesicles"; Science, vol. 297, Aug. 9, 2002. Fenghua Meng, et al. ; "Biodegradable Polymersomes"; Macromolecules, 36, 3004-3006, 2003. Foreign communication related to a counterpart application dated Jul. 25, 2006. Heller, et al., Release of Norethindrone from Poly(Ortho Esters), Polymer Engineering and Science, Mid-Aug., 1981, vol. 21, No. 11 (pp. 727-731). Hoffman, H. et al. ; "Influence of Ionic Surfactants on the Viscoelastic Properties of Zwitterionic Surfactant Solutions", Langmuir; vol. 8, pp. 2140-2146, 1992. Hoffmann et al. ; "Flow Birefringence and Rheological Measurements on Viscoelastic Detergent Solutions"; Lehrstuhl fur Physikalische Chemie der Universitat Bayreuth 30, pp. 237-250, May 1997. Liu, Y., et al. ; "Small-Angle Neutron Scattering Analysis of the Structure and Interaction of Triblock Copolymer Micelles in Aqueous Solution"; Macromolecultes; No. 7, p. 2236-44, Apr. 7, 1998. M. Ahmad, et al. : "Ortho Ester Hydrolysis: Direct Evidence for a Three-Stage Reaction Mechanism," Engineering Information Inc., NY, NY, vol . 101, No. 10 (XP-002322843), May 9, 1979. Ma, J. et al. ; Improved interfacial Coacervation Technique to Fabricate Biodegradable Nanocapsules of an Aqueous Peptide Solution from Polylactide and its Block Copolymers with Poly(Ethylene Glycol); Colloid & Polymer Science, 279, No. 4, p. 387-92, Apr. 2001. Marchessault, R.H. et al. ; "Preparation and Characterisation of Low Molecular Weight Poly(3-Hydroxybutyrate)s and their Block Copolymers with Polyoxyethylene"; Polymer Preprints; vol. 40, No. 1, p. 527-8, 1999. N. Kumar, et al. ; "Biodegradable block copolymers"; Advanced Drug Delivery Reviews; 53; pp. 23-44, 2001. Notice of Allowance and Notice of Allowability for U.S. Appl. No. 11/127,583, dated May 28, 2009. Notice of Allowance and Notice of Allowability for U.S. Appl. No. 11/244,345, dated Sep. 16, 2009. Office Action for U.S. Appl. No. 11/127,583 mailed Nov. 25, 2008. Office Action for U.S. Appl. No. 11/244,345, dated Feb. 17, 2009. Office Action from U.S. Appl. No. 11/127,583, filed Mar. 25, 2008. Office Action from U.S. Appl. No. 11/244,345, filed Mar. 27, 2008. R. Dimova et al. ; "Hyperviscous diblock copolymer vesicles"; The European Physical Journal E; 241-250, 2002. San Yeob Park; et al. ; Micellization and Gelation of Aqueous Solutions of Star-Shaped PLLA-PEO Block Copolymers; Center for Advanced Functional Polymers; Korea Advanced Institute of Science and Technology; Macramolecules, 36, 4115-4124, 2003. Saul, Dorothy et al. ; "Phase Structure and Rheological Properties of a Mixed Switterionic/Anionic Surfactant System"; J. Chem. Soc. Faraday Transactions 2, 70; pp. 163-170, Jul. 1973. U.S. Appl. No. 11/048,465, filed Feb. 1, 2005, Todd, et al. U.S. Appl. No. 11/048,489, filed Feb. 1, 2005, Todd, et al. U.S. Appl. No. 11/049,464, filed Feb. 2, 2005, Mang, et al. U.S. Appl. No. 11/049,483, filed Feb. 2, 2005, Mang, et al. U.S. Appl. No. 11/049,601, filed Feb. 2, 2005, Mang, et al. U.S. Appl. No. 11/127,583, (Pending), Saini. U.S. Appl. No. 11/147,093, (Pending), Todd, et al. W.E. Hennink et al. ; "Novel crosslinking methods to design hydrogels"; Advanced Drug Delivery Reviews; 54; pp. 13-36, 2002.